The ancient DNA of mainland Finland shows that the ancestors of the indigenous Saami people emigrated from Siberia at least 3,500 years ago. The results reveal a possible path along which the ancient Siberian peoples spread to Finland and northwestern Russia. The former Finnish populations have probably lived a nomadic and mobile life, trading and moving over a wide range, with extensive contacts with other populations. Experts believe that, until the Iron Age, the ancestors of the Saami – of whom we knew very little previously – lived in a larger region of Finland than today. . Researchers from the Max Planck Institute for the Science of Human History and the University of Helsinki analyzed the first ancient DNA of mainland Finland. For the study, genetic data at the genome level of 11 individuals were retrieved. Eight individuals came from the Kola peninsula, six from a burial dated 3,500 years ago and two from a Saami cemetery dating from the eighteenth to the nineteenth centuries. The other three individuals analyzed for the study came from a water burial in Levänluhta, Finland. Levänluhta is one of the oldest known burials in Finland in which human bones have been preserved. The bodies were buried in what was once a small lake or pond, which seems to have contributed to an exceptional conservation of the remains. The study compared the old individuals not only to each other, but also to modern populations, including Saami, Finnish and other speakers of the Uralic language. They found that among the modern European populations, the Saami have the largest proportion of this ancient Siberian ancestry. The Saami are the indigenous people of Scandinavia and live in the Arctic regions of Norway, Sweden, Finland and Russia, in a region known as Sapmi. Although traditionally associated with reindeer husbandry, only 10% of Saami remain in the reindeer sector, with some 2,800 full-time semi-nomadic herders. Anthropologists had previously suggested that this group may have Asian or Siberian roots, but their origins remained a mystery. They extracted the old DNA from the bones and teeth of a 3,500-year-old burial in the Kola peninsula in Russia, as well as from a burial in water dating from 1 500 years in Finland. 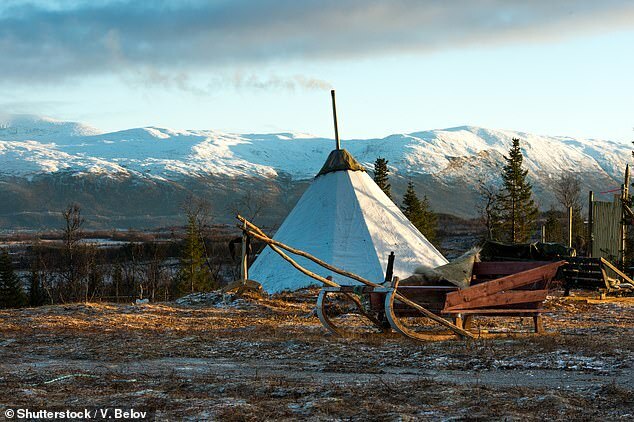 The researchers discovered the oldest evidence of Siberian ancestry in Fennoscandia in a population inhabiting the Kola Peninsula. This goes back about 4,000 years, according to the paper published in Nature Communications. This genetic ancestry then spread to populations living in Finland. 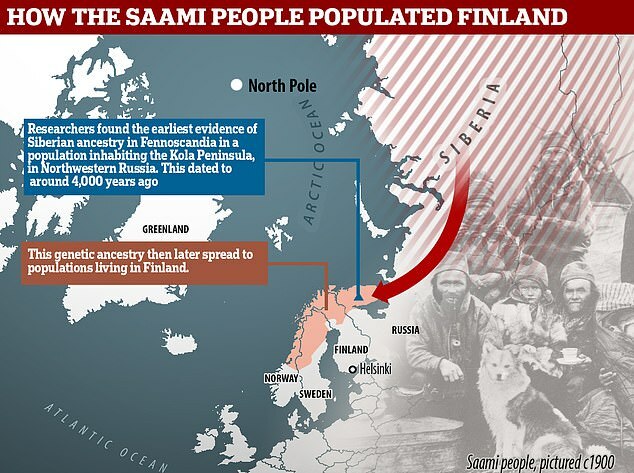 The study also revealed that people genetically similar to the Saami people of today lived in much more southern regions of Finland than the Saami today. "We were surprised to find that the oldest samples studied here had the highest proportion of Siberian ancestry," said co-author Stephan Schiffels, of the Max Planck Institute for the Science of Science. human history. 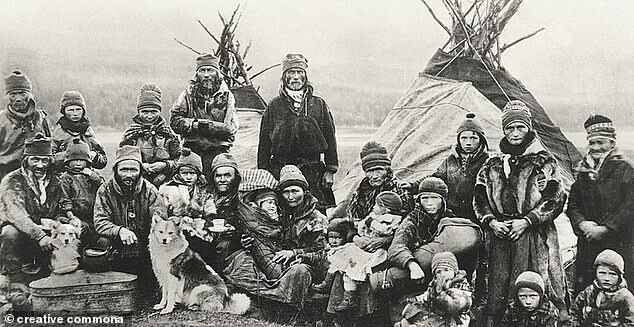 Of the modern European populations, the Saami have the largest proportion of this ancient Siberian ancestry. Experts believe that, until the Iron Age, the ancestors of the Saami (photo archive) lived in a larger region of Finland than today. On the photo, Saami between 1900 and 1920. The Saami, an indigenous people of Scandinavia, live in the Arctic regions of Norway, Sweden, Finland and Russia, in a region known as Sapmi. Around the world, the Nganasan people, native to northern Siberia, have the largest proportion of ancient Siberian origins. "Our results show that there was a strong genetic link between ancient Finnish and ancient Siberian populations," said Thiseas Lamnidis, co-lead author of the study. This suggests that "the ancient Siberian populations may have also shared a subsistence strategy, languages ​​and / or cultural behaviors with the Finns of the Bronze Age and the Iron Age, despite the great geographical distance, "he said. The researchers found that the population of Levänluhta was more closely related to the Saami people today than to the Finnish non saami population of today. "People close to the Saami who inhabit much more southern Finland than the Saami today," said co-author Kerttu Majander of the University of Helsinki and the University of Helsinki. Max Planck Institute for the Science of Human History. Interestingly, a recent linguistic study has suggested that the place names around Levänluhta go back to the Saami languages. "This is the first Finnish DNA exploration and the results are very interesting," said Dr. Schiffels. "However, older DNA studies in the region will be needed to better understand whether the models observed are representative of Finland as a whole." WHAT IS THE VARIATION OF EUROPEAN ANCIENCE IN THE DIFFERENT REGIONS OF THE UNITED KINGDOM? Although the DNA of British residents is on average 60.56% European and 36.3% Anglo – Saxon, the data breakdown reveals variations in the United Kingdom and the United Kingdom. in some parts of England. For example, Yorkshire stands out as the most "British" county, with 57.98% of European descent and 39.93% of Anglo-Saxon descent. Scotland is the most European region of the United Kingdom, the average DNA of Scottish residents being 71.89% European and 26.24% Anglo-Saxon. The type of European ancestry also varies by region of the United Kingdom. For example, 2.56% of the DNA of an average London resident originates from Italy and Greece (Southern Europe), while residents of northwestern Ontario have the largest number of residents. England have only 1.32% of South European ancestry. The Yorkshire residents have more Scandinavian DNA than any other British resident, with 10.36%, while the Welsh have the least Scandinavian ancestry (6.81%).